In more ways than one, Eminem gleefully unleashed a storm on the world last night as he launched a scathing critique of Donald Trump's tenure as US president at the BET Hip-Hop Awards. In his prerecorded freestyle 'The Storm,' the rapper targeted Trump for his recent dispute with the NFL, the escalating tension in North Korea and his luxurious lifestyle. To be honest, that's just the start. Throughout the tune, we hear lyrics like Trump's “a kamikaze that’ll probably cause a nuclear holocaust." The rapper leaves his most savage remark for the very end though. 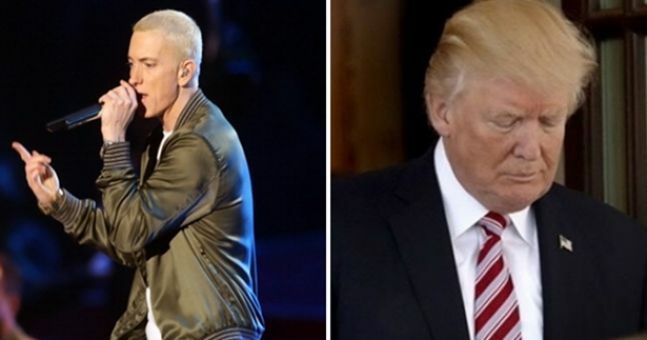 Eminem closed his freestyle by saying: "We love our country and we love our military, but we f***** hate Trump." Now that's a mic drop. The excitement was already at fever pitch as the rapper gets set to release his new album, but after this recent performance, it's safe to assume that we're going to getting a lot more politically charged lyrics on Eminem's new album.